Welcome to Cultures. 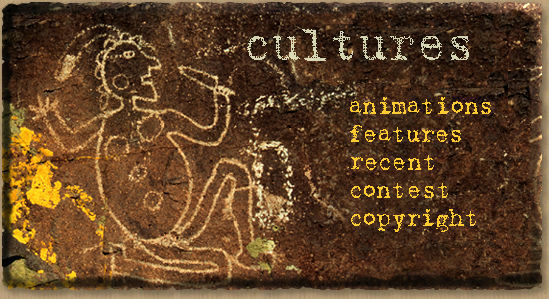 This site is devoted to cultures, living and ancient, and the promotion of world communication and world peace. Bienvenue. Cultures est consacré à la promotion de la communication mondiale et de la paix mondiale. Nous croyons ardamment que les Etats-Unis ne peuvent pas et ne devraient pas agir indépendamment dans le monde sans ses alliés et amis. For Greek Mythology, see our sister site Mythweb. For the ancient cultures of Mesoamerica including the Olmec, Maya and Aztec, please visit Mesoweb. Except as otherwise noted, this site was written, edited, art directed and programmed by Joel Skidmore. Real world location: San Francisco, California, USA. Except as specifically noted, all text and images on this site are copyright 1993-2019 Fleet Gazelle. Please respect our copyrights and those of our collaborators. The image above is from a copyrighted photograph by Dale Hekhuis.